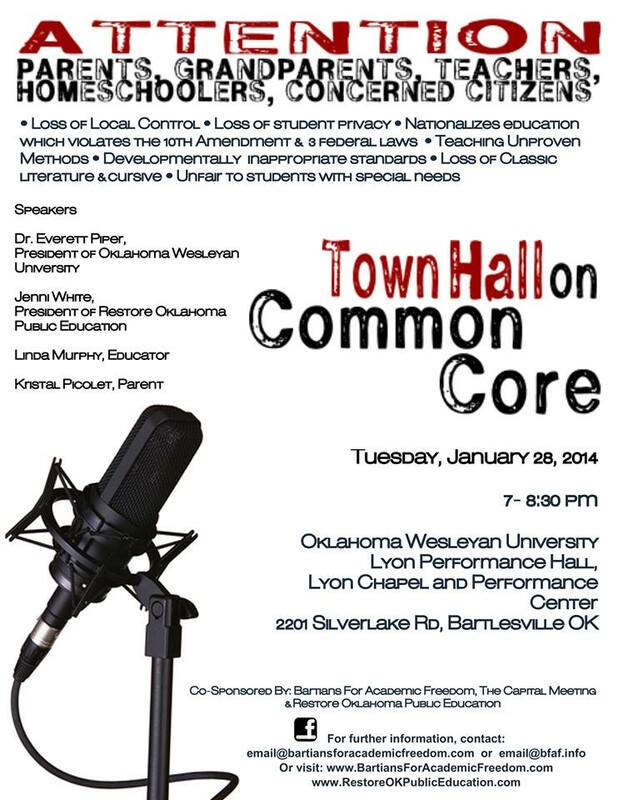 Help Stop Common Core in Oklahoma – Calls Needed! Everyone, that is, except OK Governor Mary Fallin, State Superintendent Janet Barresi, and Senator John Ford. Please call your Senator and Representative and tell them you want Common Core repealed in Oklahoma. 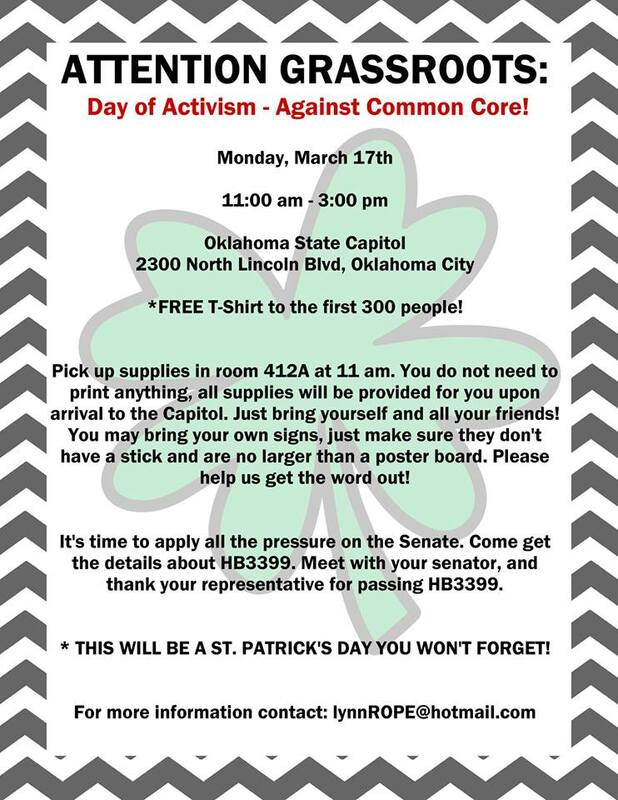 Especially, call and email Pro-Tem Brian Bingman and Sen. John Ford and tell them to say YES to the repeal of the Common Core in Oklahoma. A bill to separate Oklahoma from the Common Core could be coming to a vote in the Senate early next week! Remember the legislature is attempting to be out of session by next Wednesday or Thursday, so now is crunch time! Call and/or email your Senator IMMEDIATELY and ask them to pass ANY bill that comes to the senate that STOPS the Common Core. As you know, our previous bills to stop the Common Core have been prevented from being allowed even a hearing in either the House or Senate Education Committees by Representative Ann Coody and Senator John Ford. House Speaker T.W. Shannon has now come out against the Common Core setting the tone for the House! Shannon announced Thursday that with just two weeks left in the legislative session he is unveiling a measure to repeal a 2010 law that requires common core to be implemented by Oklahoma school districts. Please thank him via phone call 405-557-7374, Email: tw.shannon@okhouse.gov or post to his Facebook page (http://www.facebook.com/twshannon?ref=ts&fref=ts). A bill to STOP the Common Core MUST FINALLY GET A HEARING in the Senate. There are no accidents in politics. While the state of Oklahoma was implementing “ObamaCare” compliant health care reform, (Electronic Health Records, OHIET, etc. ), education reform was running on a parallel track, instituted via SB 222 in 2009 (P-20 Data Council) and SB 2033 in 2010 (K-12 Common Core). These bills had the support of Republican leadership. Think these data systems are to be kept separate? Look at this diagram describing what the Statewide “Identify as a Service” federated identity management system (federated = single-sign on accesses several systems) would look like. It clearly links the Department of Education system and the Department of Human Services systems. 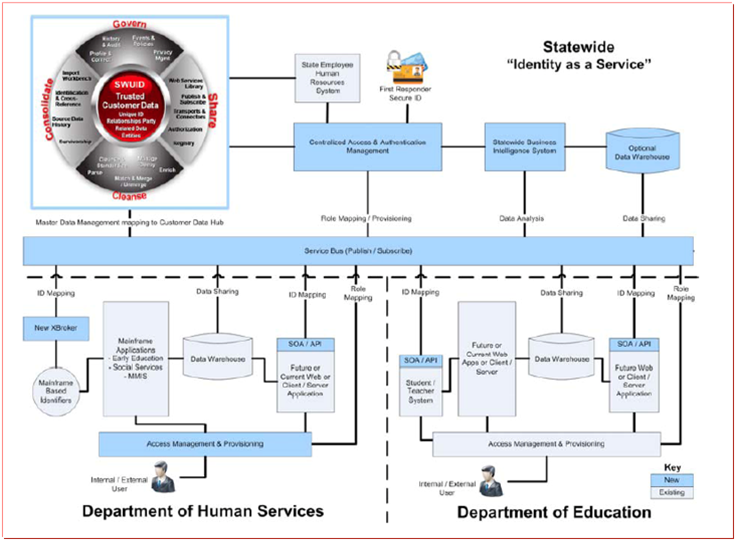 (Diagram is from a ppt entitled “Federated ID Management & SICAM in Oklahoma HHS Agencies”, dated July 2011, accessed through OHCA records.) More information in that power point included linking together other state agencies/systems into one interconnected system. These agencies have information sharing agreements with agencies and entities outside the state. Feel better now? 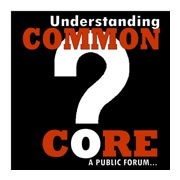 The Common Core “standards” concept came out of the same tech-cesspool as the ObamaCare “standards”. In both sectors the “standards” have nothing to do with actual education or health care. They have everything to do with the “standards” that enable these technology systems (i.e. “standardized” computer hardware and software systems technology) to be interoperable. They are to be interconnected one with another. 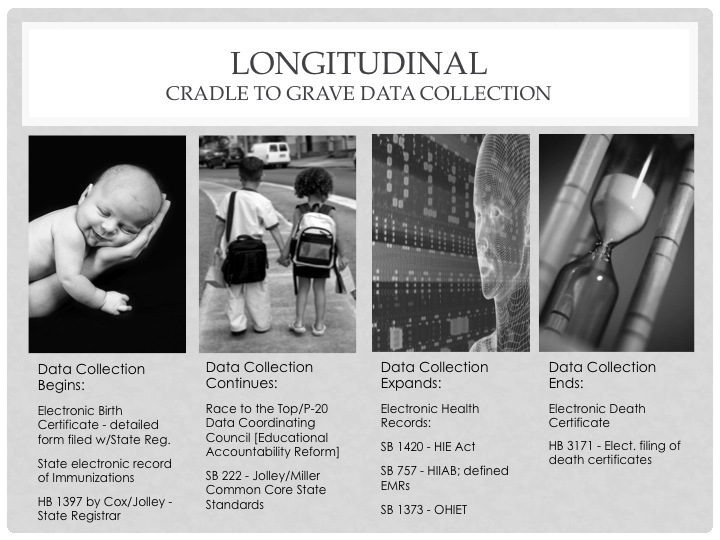 The standardized, interconnected technology systems are what enable an electronic “cradle-to-grave” (longitudinal) record on every single person. For an idea of what this means for the people of this state, of this country, see the OK-SAFE image below from our pending power point presentation entitled The Architecture Defines the Policy.